First let me apologize for the sloppiness in some of my posts. I hate typos more than anyone and yet I can’t seem to publish a post without something being wrong. I have Victoria look them over when she gets the post in an email but by that point everyone who is subscribed has already gotten it. I think there were four in the post for Tuesday but I vow to improve. I think I’ll start reading them aloud as my last read through, instead of just reading them. Wednesday was a day game and I left my parents’ house at 10:45. I parked in the Money lot at 11:50 and made a few phone calls before heading in. I checked to see if I could stop by an Aunt and Uncle’s place in Springfield on my way to St. Louis on Thursday. They’re leaving Thursday morning for the reunion so they won’t be around, bummer. I might stop by on my way back to Wisconsin on Sunday evening. 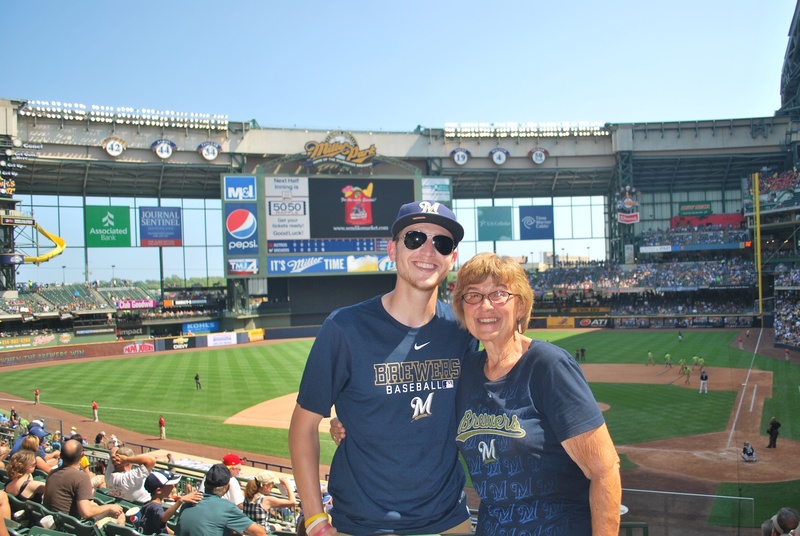 I also confirmed with my Aunt Anne that I could stay with them over the weekend when the Brewers play the Cardinals. The twitter follower who was joining me for the game, Marlene, had called and said she was waiting outside of the stadium near the home plate entrance. I met up with her, gave her my extra ticket, then went inside. It took me a little bit to put my stuff back in my drawstring bag after the inspection and I couldn’t find Marlene when I finally made it inside. I later learned that she had thought I left her to do my own thing once I was inside, which was not the case. I had to get the game number picture in section 102 (on the field level) and I wound up going over there while she went and sat in her seat. After getting the picture taken I went up to the loge level and got my designated-driver beverage (lemonade) and another Polish. At this point I’m on pace to consume 121.5 sausages. That’s a lot of encased meat. I really wish I would have gotten a cholesterol test before the season, and then one after the season, for curiosity’s sake. My blood pressure hasn’t changed at all though, and it’s always right around the 110/65 range. Since my seats are in the sun for the first few hours I asked Marlene if she wanted to stand in front of the press box for a few innings. She agreed and we set up shop behind section 218. 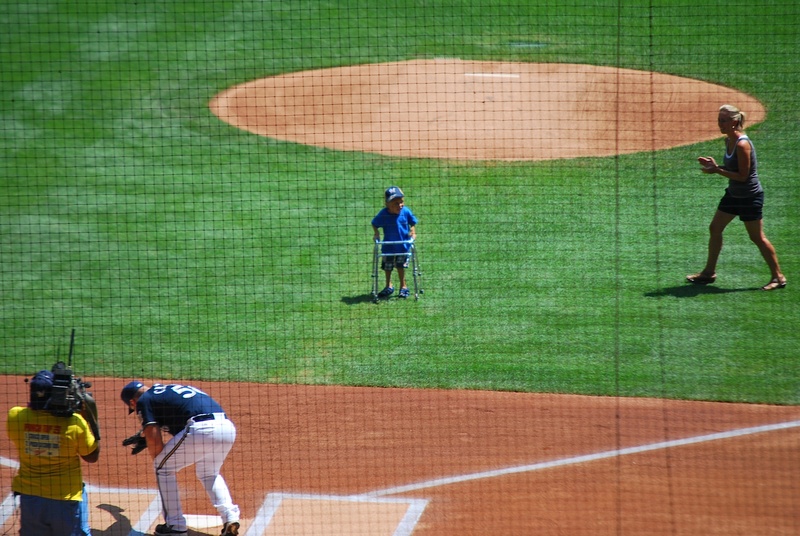 One of the ceremonial first pitches was thrown by a kid who was a part of the Make-A-Wish Foundation. It was sad and heartwarming at the same time. This was our view from behind section 218 when Mike Fiers was about to let go of the first pitch to Jordan Schafer. 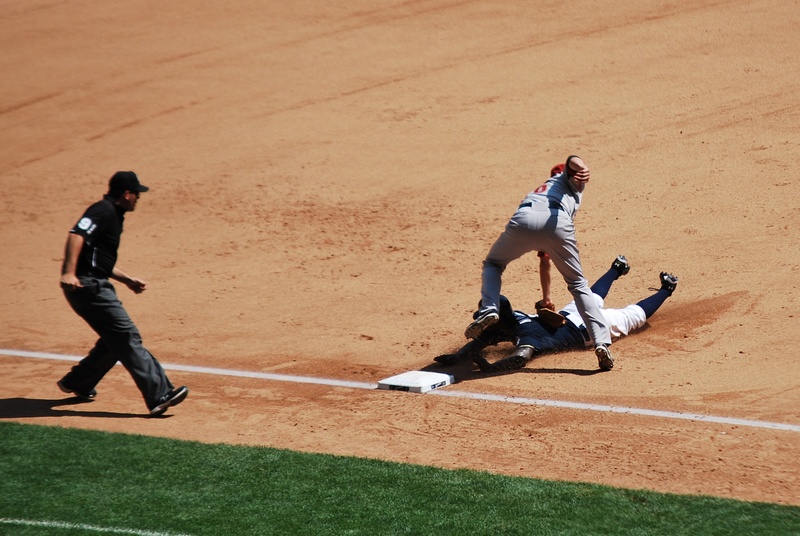 Nyjer’s hands are in the 3rd baseman’s shadow, but they appear to be at least six inches off the base. The glove (with the ball inside) is touching his lower back. The umpire’s call? Safe. Brad Mills, the Astros manager, came out and argued for a bit then retreated to the dugout. If Major League Baseball had a better replay system this call would’ve been reversed within 20 seconds and time would’ve been saved because Mills wouldn’t have come out to argue. 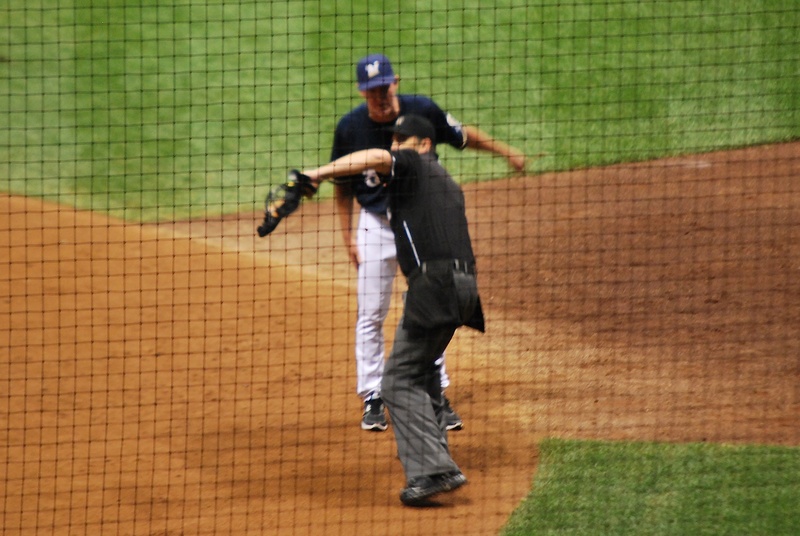 Next up was Ryan Braun and he took advantage of the blown call at third. He bounced a single up the middle and the Brewers had a 5-1 lead. Two batters later Cesar Izturis hit a solo home run. Yes, you read that correctly. Izturis is not known for his power so it’s always a surprise when he puts one out. For a frame of reference he has 4,206 at bats in his career and a whopping 16 home runs, or one every 263 at bats. Seeing that he only has 155 at bats this year and already 2 home runs, you could say he’s on a tear. Later in the game he hit one over the wall down the right field line but it was 8 feet foul. He was that close to having a multi-home run game. Izturis’ homer in the fifth gave the Brewers a six-spot in the inning and a 9-2 lead. The following picture consists of a bunch of fans celebrating Izturis’ home run. In the background (between the two guys on the right) you can see Izturis and Sedar shaking hands as the former ran past. After the 5th inning I had a fan a few rows behind us take a picture of me and Marlene. Marlene is a diehard Brewers fan and I had a great time talking to her about the game of baseball and how much she enjoys it. She handed me an envelope before the game that had the $40 donation for Be The Match inside, and when I got home I also found a very nice note that she had written as well. If everyone was as kind as Marlene I think this world would be a better place. Thanks again, Marlene, for a great afternoon and for the donation. It was crazy, seven straight foul balls on 95-96 MPH fastballs. I think if I were Rodriguez I wouldn’t have been so stubborn and after two or three foul balls I’d try to drop a curveball in there, but hindsight is 20/20. In the seventh inning Lucroy went yard and drove in Rickie Weeks in the process. 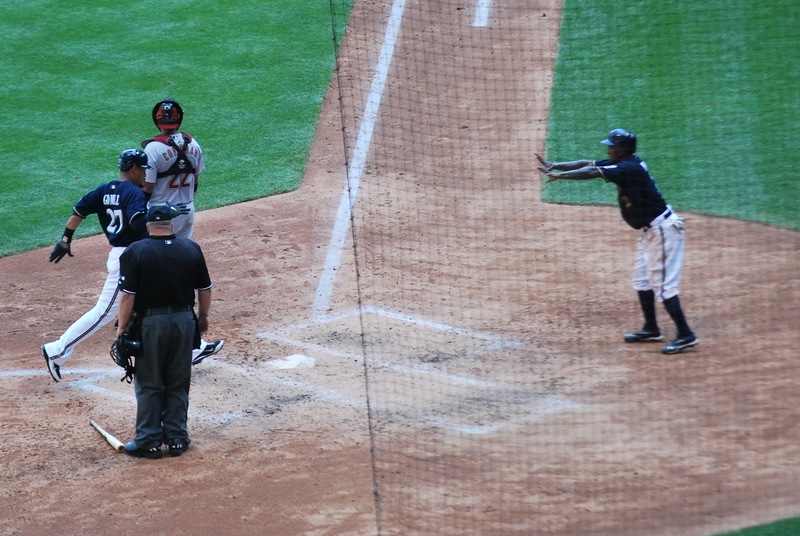 Nyjer Morgan later singled home Cesar Izturis who had doubled earlier in the frame. The Astros scored two in the 8th to cut the deficit to nine, but that’s all the closer they got. Final Score: Brewers 13 – Astros 4. 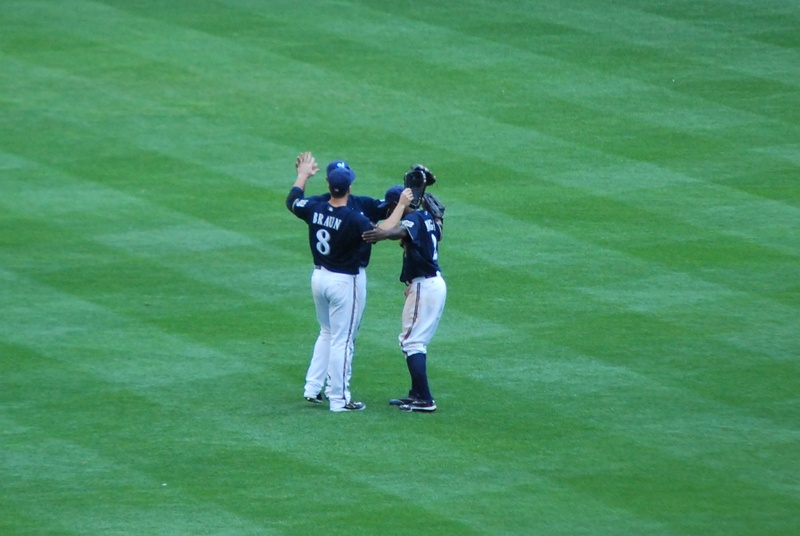 Braun, Gomez and Morgan came together after the win (as they normally do) for a post-game group hug. This is the linescore after it was all said and done. 11 of the 13 runs were earned, so while 4 errors is never a good thing, I don’t think it was the deciding factor in Wednesday’s game. It was the first sweep the Brewers have had at home this season, and while it was basically against a AAA team in the Astros, it still counts. The Astros are rebuilding and traded their veterans for prospects before the trade deadline and I can’t blame them. If you’re not very good now with the veterans you might as well try to get rid of some aging stars to build for the future. I’m leaving tomorrow for St. Louis to protect against the uncertainty of possible car trouble. 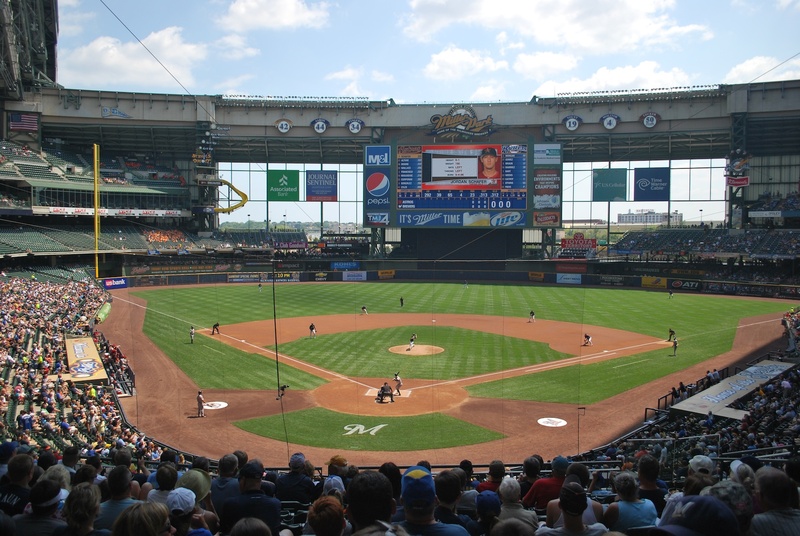 I’ll be getting to my aunt and uncle’s place around 7:00 PM so I’ll 24 hours before the first pitch of the Brewers – Cardinals game on Friday night. 2) One of the indoor seating areas. On the right hand sign there is a sign hanging that reads “Mercado Fresco”, which of course means fresh market. That’s where they make their Fresh Market guacamole. 3) The outdoor seating area where we sat, it was a beautiful day and it was nice being outside. 4) My lunch; there’s rice and beans on the left and then Bistec con Rajas y Queso in the middle which consisted of sautéed strips of steak with sliced peppers, onions and tomatoes topped with Chihuahua cheese. It’s named after it’s region of origin, not because they use Chihuahua milk, that would be silly. Not pictured are the corn tortillas that I used to make my tacos. In the background you can see the Corona that I was working on as well as the house chips that are brought to your table when you get there. It was an amazing lunch and I was so full the rest of the day that I didn’t eat dinner. 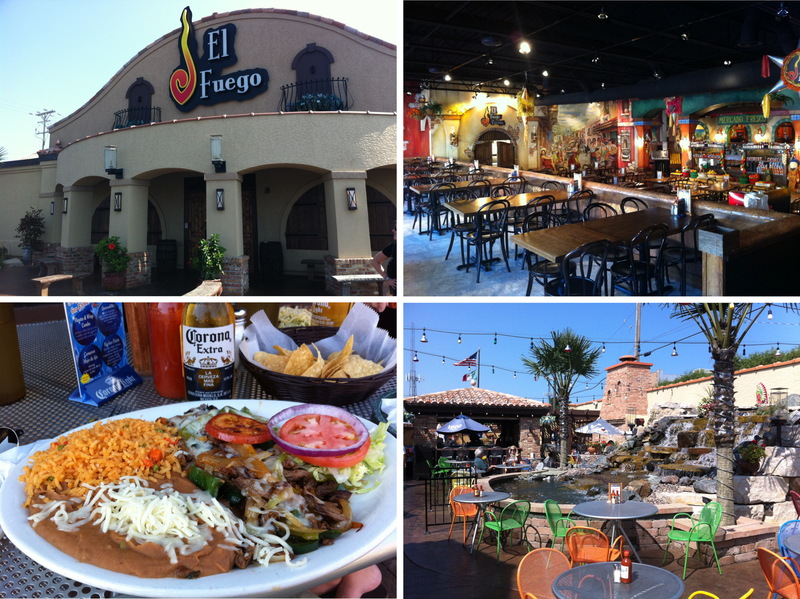 In all seriousness though, you need to make a visit to El Fuego, the food was amazing and everyone is very friendly. 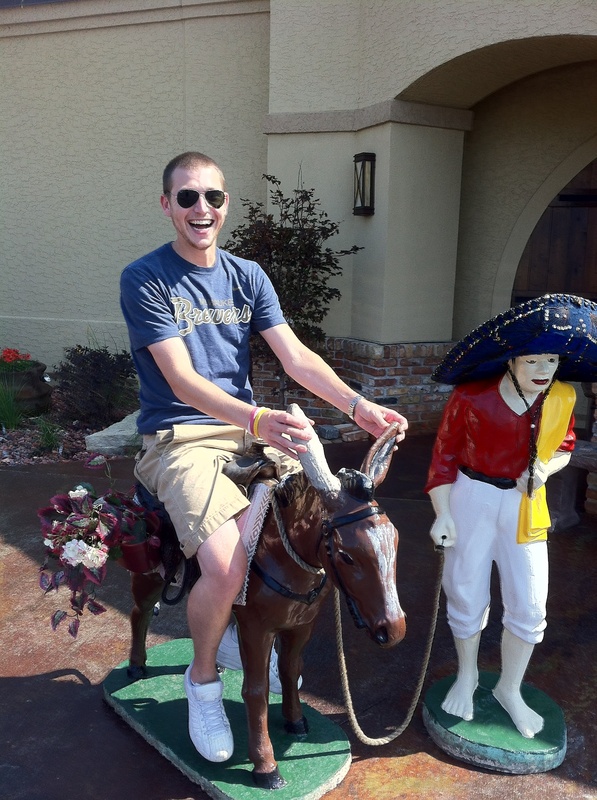 If you need to kill time before or after a flight stop by for a meal, or just go because you like mexican food. Eliza loves Target and while they have them in other parts of the world she says that it’s just not the same. We still had some time before the game so we went to the Target that’s on Miller Park Way. We were there for over an hour and I walked around with Eliza for a while, got tired, and took a nap in a rocking chair that’s on display by the baby cribs. I wasn’t planning on falling asleep but I found myself jolting awake every so often. 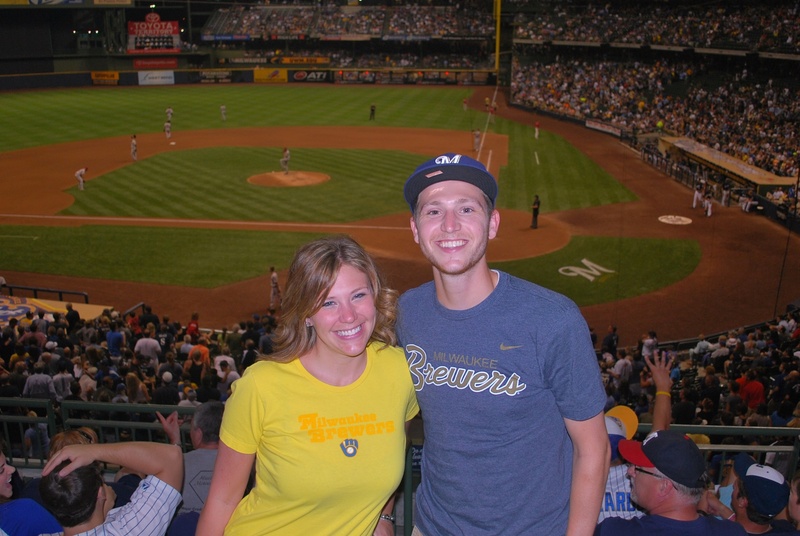 We picked up a mixer-sixer from the grocery store next door and made our way to Miller Park. We were parked by 5:35 and spent an hour throwing back a few cold ones and catching up. 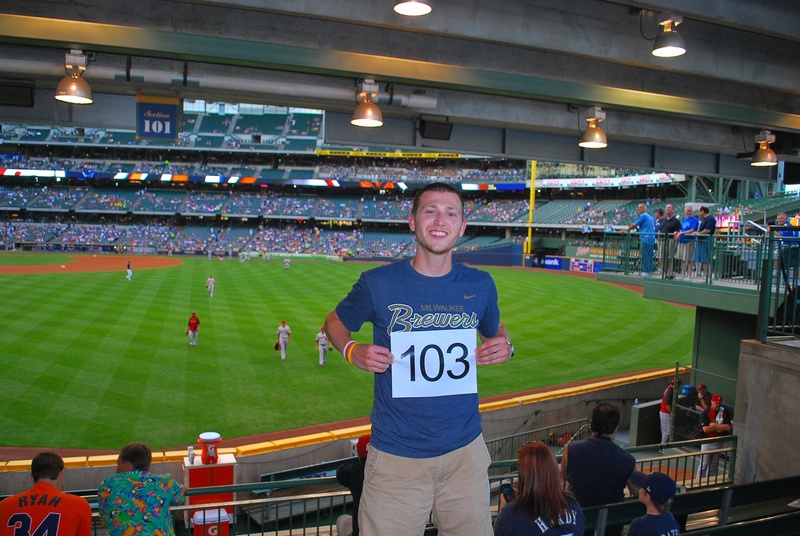 We were inside at 6:48 (cutting it close) and went to section 101 for game photo number 103. 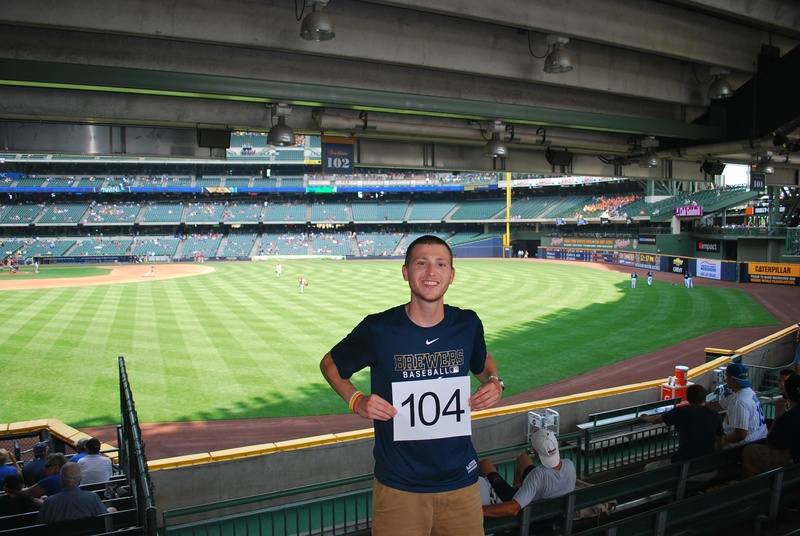 Working my way around the field level won’t be easy, and I’m not really looking forward to trying to get the next 24 pictures at Miller Park. The field level usually fills up before the rest of the stadium which will make it difficult to maneuver at times. I’m up for the challenge though and getting there earlier should make it easier. 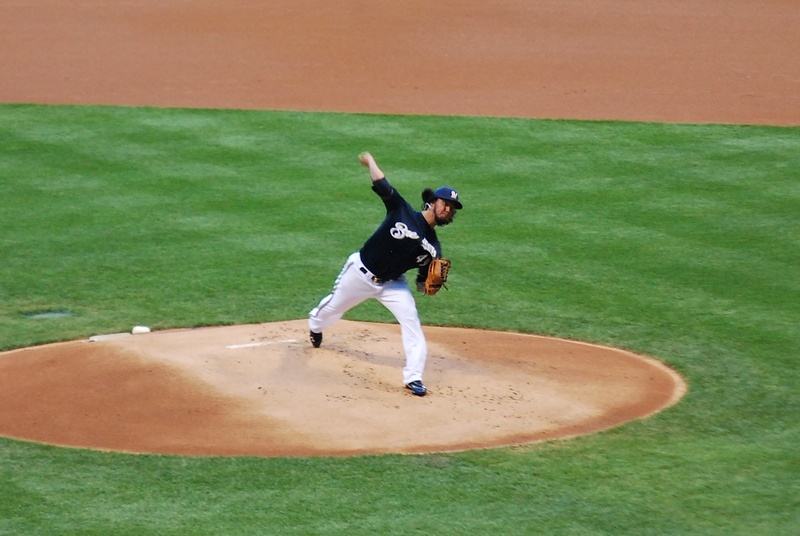 In the bottom of the first inning the Brewers staked Gallardo to a 1-0 lead when Aramis Ramirez singled to left field. He’s not in the best hitting position but he did have to reach for it and perhaps he was a little fooled with the changeup. He got the job done and that’s all that matters. Three pitches later the Astros starter got out of the jam by getting Corey Hart to break his bat and ground into a double play. I snapped a picture just after he made contact. 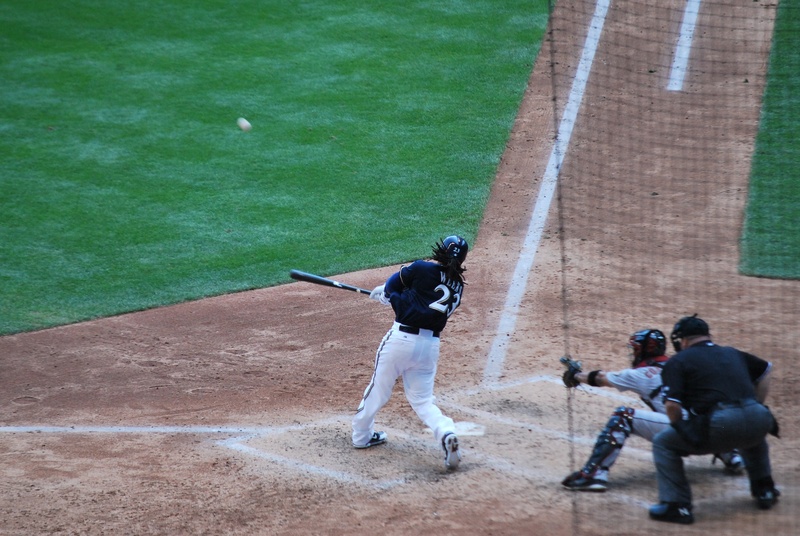 In the second inning the Brewers got a run on a sacrifice bunt that turned into a base hit and an RBI. Gallardo laid a perfect bunt down and it went up the first base side. 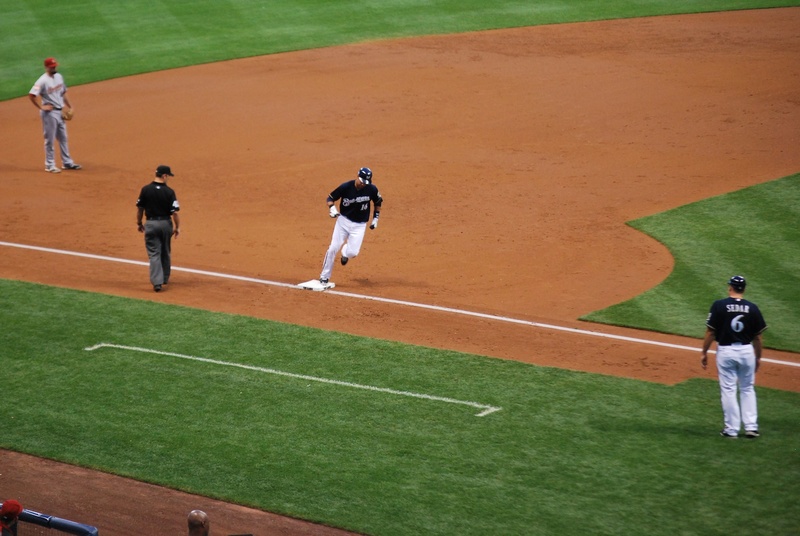 Rickie raced home and scored the Brewers’ second run. The throw to get Gallardo at first glanced off his back and all hands were safe. The Astros got one back in the third on a solo home run from Chris Snyder and they cut the lead to 2-1. 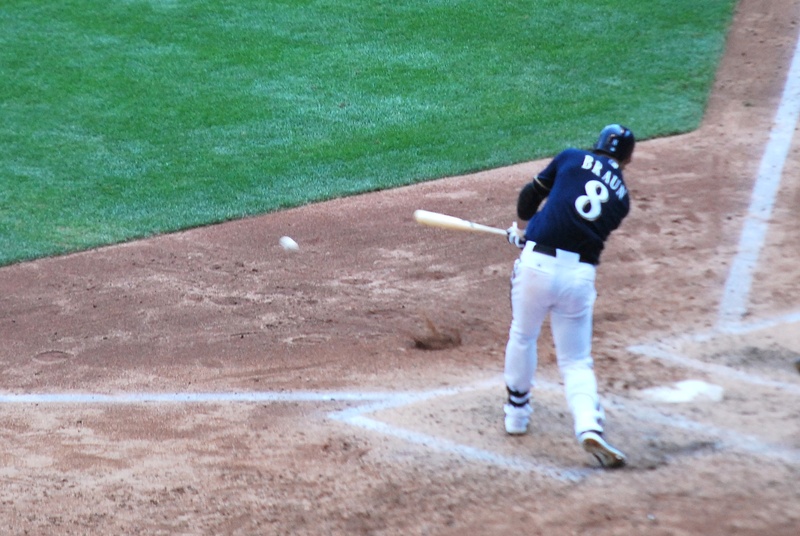 The Brewers answered with three in the bottom of the third, all coming on a home run from Aramis Ramirez. 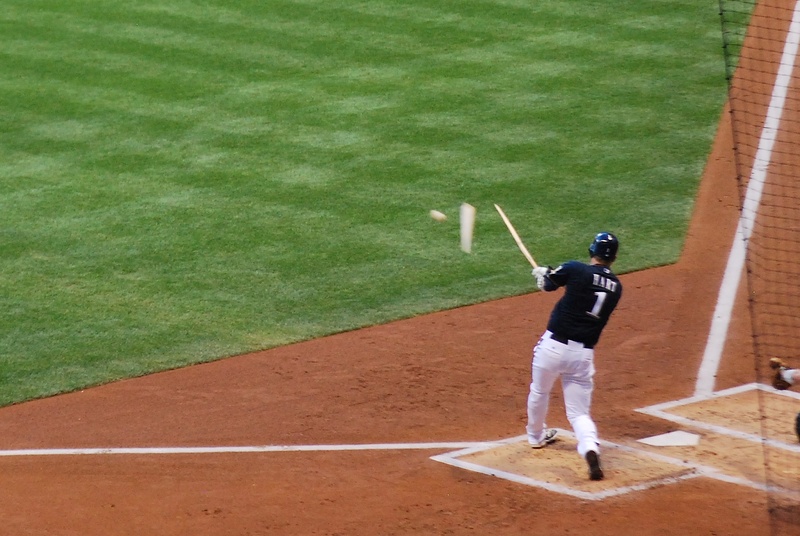 In the fourth inning Aoki stepped to the plate with one out. On the 1-1 pitch he fouled one back in my direction, I had my glove on (which I almost always do with a lefty at the plate) and quickly stood up. I could tell it was sinking fast so I stepped down one step, reached across the railing that divides the staircase and made the snow-cone grab. Nice!!! I had to check my glove because I wasn’t sure if I had held on. 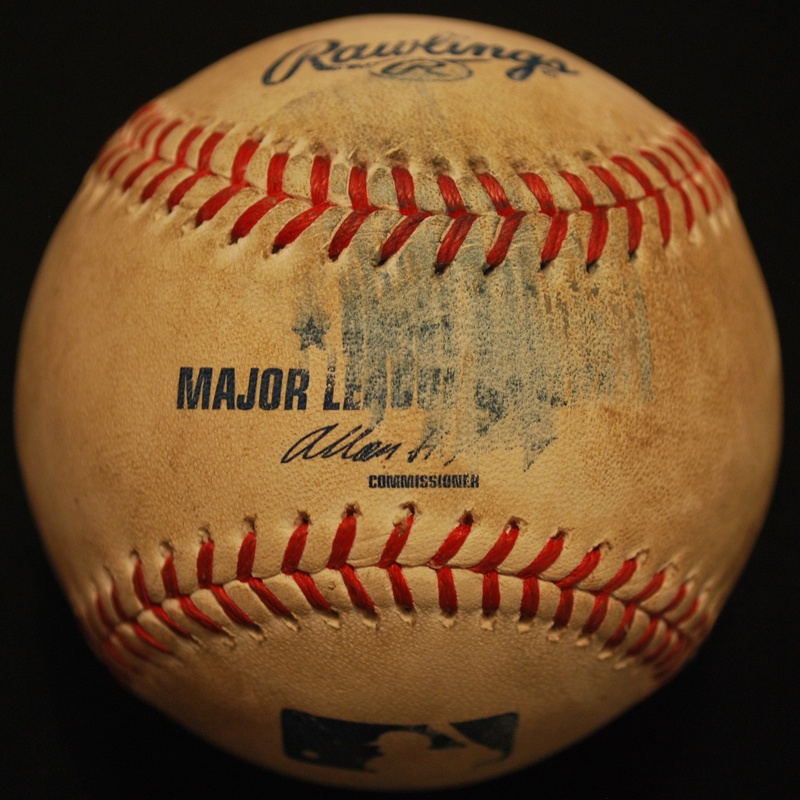 It’s a beauty, check out the smeared ink from where Aoki just nicked it with his bat. I don’t think they showed it on TV because my Twitter account didn’t explode and I didn’t get many texts about it. I did get a few but they were from people that were at the game. I had brought a batting practice ball that I had gotten in 2010 to the game, and after the final out I gave it to a little girl that had brought a glove. She was ecstatic and her father thanked me profusely. In the middle of the sixth inning I had the lady behind us take a picture of Eliza and me. I’m glad she’s back in the States but a little sad that I won’t be joining her at the Sykes (my mom’s side) family reunion this weekend. There’s a Sykes reunion every other year in Wautoma, Wisconsin and it’s quite the spectacle. My mom is one of twelve and I’m one of 22 grandchildren to my mother’s mother. Not everyone makes the trip but most do and it’s a lot of fun. 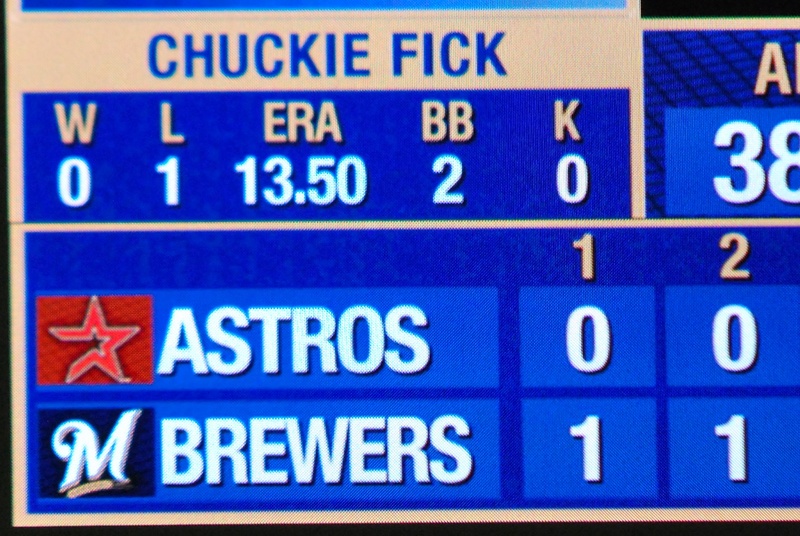 In the 8th inning the Brewers tacked on two more runs. 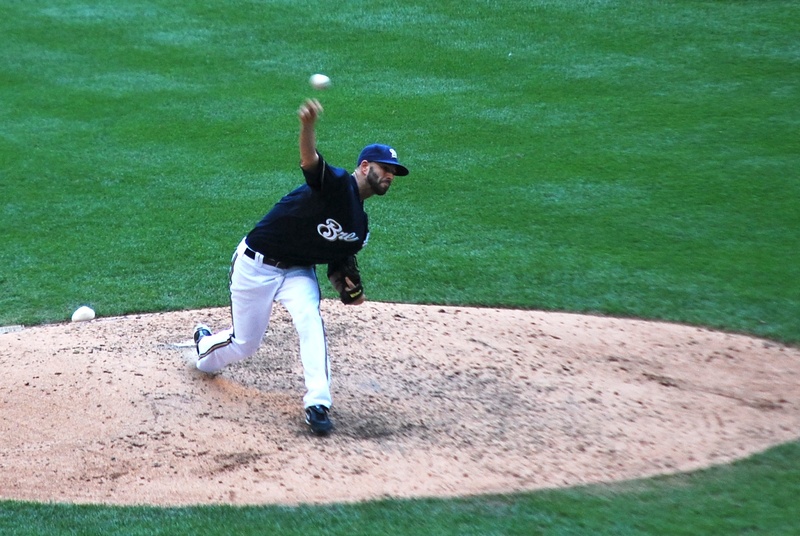 Francisco Rodriguez came on for the ninth with a nine run lead. 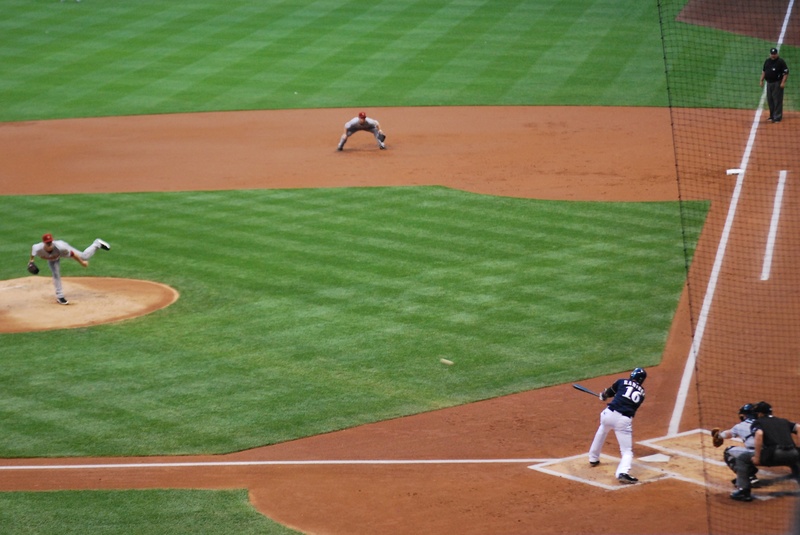 While Maxwell batted to lead off the inning Brewers bench coach Jerry Narron was yelling at the umpire from the Brewers dugout because he thought some pitches were strikes. Home plate umpire Brian Knight wasted no time in tossing Narron and then Roenicke came out to have a word. He must have said one of the trigger words and soon he was tossed as well. Here’s Knight about to make the throwing motion to signify “YOU’RE OUTTTA HERE!! !” The picture is a little blurry, you can blame the protective screen. 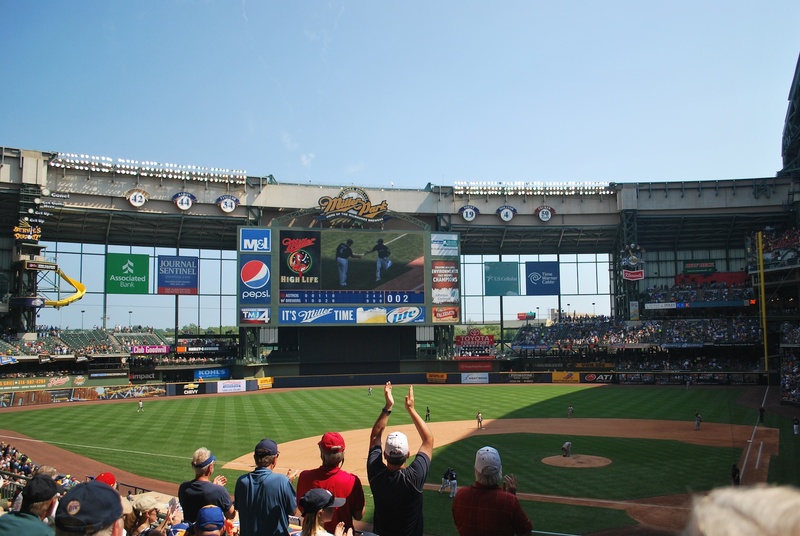 K-Rod retired the side in order in the ninth, and the Brewers were victorious once again. Final Score: Brewers 10 – Astros 1. The Astros traded a bunch of their bigger names away and I think their highest paid player is making $1.15 million or something like that. They’re rebuilding and I wish them nothing but the best in the American League next year. It could be brutal for a while but they’ll be back. The moon phase was waxing gibbous, and Wednesday is going to be a full moon. 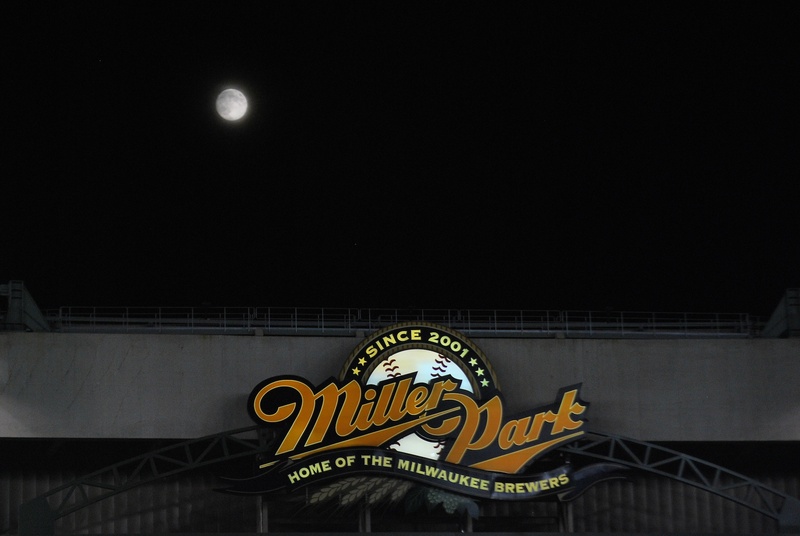 At about 9:00 I got a picture of the moon and the Miller Park sign above the scoreboard. I had posted a similar picture earlier in the year, so this might be nothing new for some of you. It was a little cloudy, so this one is slightly different than the earlier picture. I’m leaving in 20 minutes for game number 104, and I’m attending today’s game with another twitter follower. Perhaps the Brewers can pick up a sweep of their own.